Thursday Political Mix: Obama, Insurers Need Each Other : It's All Politics The Obama administration refrains from attacking the health-insurance industry in order to get the Obamacare website fixed ASAP... Virginia is for lovers (of political recriminations)... Colorado's supporters of a failed effort to boost taxes for public education try to regroup. President Obama visited Dallas Wednesday partly to cheer up volunteers who help people enroll in Obamacare. Good morning, fellow political junkies. The assessments of the meaning of the 2013 off-year elections continue, with both parties trying to draw lessons from Election Day's outcomes, with the likely overinterpretation of some of them, though it wasn't always clear which. Just how the problems with the Affordable Care Act fit into those election results continue to be a big part of the evaluation of what happened Tuesday. 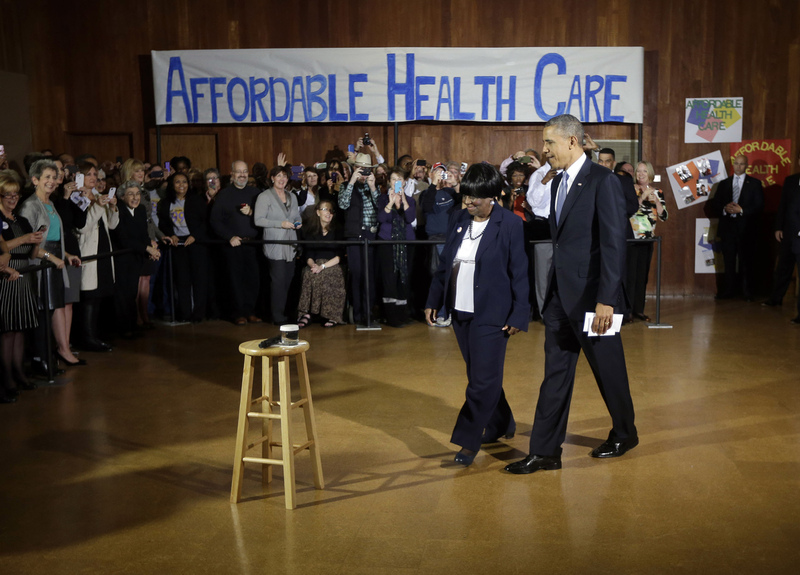 While the extent of the ACA's impact was uncertain, some things were obvious. Obamacare's continuing political fallout seemed to weigh down Democrats while the new bounce in the steps of Republicans seemed even bouncier. With that, here are some of the more interesting items of political news and analysis that caught my eye this morning. The Obama administration needs the cooperation of the health insurance industry if the Obamacare website is to get fixed anytime soon. Which is why, even as many Democrats would like President Obama to blame the insurance industry for sabotaging the health law with all those cancellation letters, the president has refrained, reports the Hill's Justin Sink. Meanwhile, insurers need the stream of newly insured, healthy, young people Obamacare is supposed to funnel to them, as well. House Republicans plan to put Democrats on the spot next week over Obamacare. The GOP-controlled House has scheduled a vote next week on legislation named the "Keep Your Healthcare Plan Act of 2013," reports Roll Call's Emma Dumain. It's just such Republican tactics that have congressional Democrats deeply worried looking ahead to the 2014 midterms. A delegation of Senate Democrats up in 2014 visited the White House to vent at the president and hear his reassurances that fixes for the Obamacare website were on the way, reports National Journal's Michael Catalani. Some Democrats think their party missed an important opportunity to negatively define the newly re-elected New Jersey Gov. Chris Christie (and potential 2016 Republican presidential candidate) during that state's gubernatorial campaign. So they plan to make up for lost time, reports the Washington Post's Philip Rucker. "Virginia is for lovers" — of political recrimination. Different Republican camps are blaming each other for Ken Cuccinelli's close loss in a governor's race they view as winnable, report John Harris and Anna Palmer of Politico. Following the crushing defeat of a measure that would have increased individual income taxes rates in Colorado for investments in public education, its supporters are attempting to regroup, reports Kevin Simpson of the Denver Post. The lopsided 65% to 35% defeat was a setback not only to education reform advocates outside the state, like the Bill and Melinda Gates Foundation which contributed to the campaign for the higher tax rates but to Colorado Democrats whose fortunes had improved in recent years, reports the New York Times' Jack Healy.